Every poker player goes on runs. Sometimes you’re locked in, making all the right decisions. Sometimes every read you make is wrong. Sometimes you’re getting hit by the deck and the chips can’t help sliding your way. Sometimes you’re playing perfectly and the cards keep conspiring to screw you. One week ago, Brian Koppelman, co-writer with David Levien of the cult classic poker movie Rounders and now the co-showrunner with Levien of the popular Showtime series Billions, took to Twitter to monologue about playing through a career cold streak. He shared an image of the call sheet for the pilot of Billions, dated January 19, 2015. “Fifteen months before,” Koppelman wrote, “I really thought my career might be over. Or radically smaller. Because in October of 2013 a (bad) movie we wrote bombed and we were fired from an HBO show we were hired to run. Our agents at the time told us we were basically un-hirable. Or that the demand for our services had shrunk. I remember walking New York City in a lost daze. It was a dark time. I’ve told this before. But I don’t think I’ve told about the conversations [my wife] amy and I had about selling our apartment and downsizing. Because, although we’d saved money, I believed the agents that there might never be another opportunity. You don’t have to be a professional screenwriter to relate to the story. A fall from grace. Self-doubt. The cold streak that feels like it might be permanent. Working through it. Taking chances. Feeling alive. That’s all in the arc Mike McDermott follows in Rounders. It’s two hours of highs and lows, of bankrolls being built and bankrolls being wiped out, of Mike deciding what to do with his life and whom to cut out of it. When he gets his pockets emptied and his face busted up after Worm is caught cheating in the policemen’s game, that’s his version of the nadir that Koppelman hit in 2013. Poker is the backdrop for the movie, but the basic humanity, the universal experience of hitting bottom and having to tell yourself, “Go do the thing” — then praying that the literal or figurative cards cooperate — is what makes it resonate. Rounders is 20 years old today. To some degree, that means modern poker is 20 years old today. If Worm hadn’t convinced Mike McD to play some cards again, if Teddy KGB hadn’t fiddled with his Oreos, if Mike hadn’t bluffed Johnny Chan, the poker boom wouldn’t have happened the way it did. Chris Moneymaker, whose name is more frequently attached to the poker explosion of the 2000s than any other, admits that he never played no-limit hold’em until he saw Rounders, and that he’d never heard of the World Series of Poker before renting the movie. Without Moneymaker playing and winning the 2003 WSOP Main Event, poker’s rise charts completely differently. And without Rounders, there’s probably no Moneymaker. But being a critical component of the build toward poker going mainstream was the last thing Koppelman and Levien, both about 30 years old and following career paths outside of filmmaking at the time, were thinking about when they sat down to write their first script. New York City poker player and writer Peter Alson had become friendly with Koppelman at underground clubs like the iconic Mayfair, and Alson happened to be noodling with a poker script idea of his own when Koppelman and Levien gave him a copy of Rounders to read. Alson says his idea was completely different — it was centered around a romance and would have been nothing like Rounders — but part of his failure to write it stemmed from uncertainty over how to find that balance between the gritty reality of poker and the glamour and flash required to make it translate on the big screen. That Koppelman and Levien located that sweet spot is what Negreanu marveled over most when he first saw Rounders — which he considers both the best and the most important poker movie ever made — in the theater. In one regard, Rounders was perfectly timed. Matt Damon’s biggest credits when he landed the lead role in this little Miramax poker movie were School Ties and Courage Under Fire. He was far from a household name. 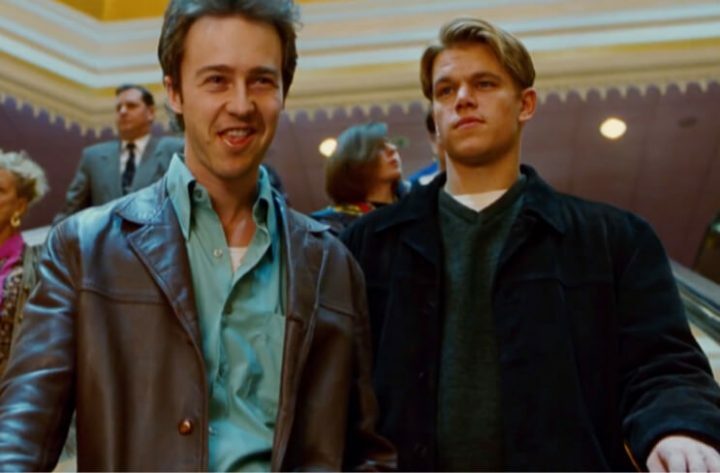 Then Good Will Hunting came out in January ’98, and by the time Damon was playing in the ’98 WSOP Main Event to crank up the publicity in advance of Rounders’ September 11 release, he was an Oscar winner. But Damon’s new star power, even in combination with the rising profile of Norton — who plays Mike’s hopelessly destructive running buddy Worm — couldn’t prevent Rounders from coming and going in theaters with little impact. On a reported budget of $12 million, the movie made $8.46 million in its opening weekend and finished with a total gross of $22.9 million. Not a bomb. But far from a smash. Critics had a mixed response, leaning positive; the movie sits at 65 percent on Rotten Tomatoes. But what’s telling is the audience score on the same site: 87 percent. Rounders was a hit on delay, a movie people discovered on DVD and on endless cable runs. Cult classics aren’t born, they’re made. Rounders found its audience a year or two after its cinematic release. And that audience was mostly made up of people who were waiting to be fascinated by poker but didn’t know it yet. And that’s where the “dumbed down just slightly” element that Negreanu referenced comes in. Rounders gave poker newbies an entry point and a desire to try the game. That was a dream come true for the veteran players out there. “It definitely brought new blood, and younger players, into the game,” Alson says. “And it was truly, from a playing standpoint, the golden age of underground poker in New York. Because the thing about Rounders was, unlike internet poker, it did not educate players. So the players that it was bringing in had this romantic idea of what it would be like to play poker in an underground club, but they had no skills. And their skills had to develop in real time, not in internet time. Rounders didn’t just expand the poker-playing base; it began the mainstream mind meld of the terms “poker” and “no-limit hold’em,” which reached critical mass a few years later thanks to the hole-card cam, the World Poker Tour, the WSOP, and Moneymaker. By around 2003 or 2004, someone inviting you over for “poker night” invariably meant a no-limit hold’em tournament. But most people seeing Rounders for the first time had barely heard of such a thing. Even though no-limit isn’t the only game played in the movie — seven-card stud is central to a couple of scenes — it’s the game everyone wanted to try after watching Mike reel Teddy in holding the nut straight. Beyond bringing new players into the game and popularizing no-limit, the movie’s impact was felt in other ways. Rounders began the process of making stars out of poker players. Most viewers had never heard such names as Doyle Brunson, Amarillo Slim, Phil Hellmuth, and Nick the Greek before. Now those names were out there — and now Johnny Chan was the poker GOAT as far as the public was concerned. Also, charity poker, still a vibrant philanthropic outlet two decades on, has many of its roots in the poker/Hollywood crossover that Rounders kicked into gear. But maybe Rounders’ greatest accomplishment was indoctrinating us in a world that most people didn’t know existed. There are the underground poker clubs, of course. But there are also the Russian and Turkish baths, the grinders like Knish. It’s all rooted in an unglamorous reality. But it was so foreign to many viewers as to seem exotic. There’s been talk, on and off, for years, about a Rounders sequel. Koppelman and Levien have said that they have an idea for the plot — but beyond that, they have no desire to speak about it. They’re busy with Billions now, so you get the sense that Rounders 2 is, at best, a few years off. Is there going to be a Rounders sequel?